My first time to Italy was magical because we visited Venice, Bologna, and Rome. I’m here to tell you all about our trip to Bologna and how if you’re planning a trip to Italy, it’s a city that must not be missed. 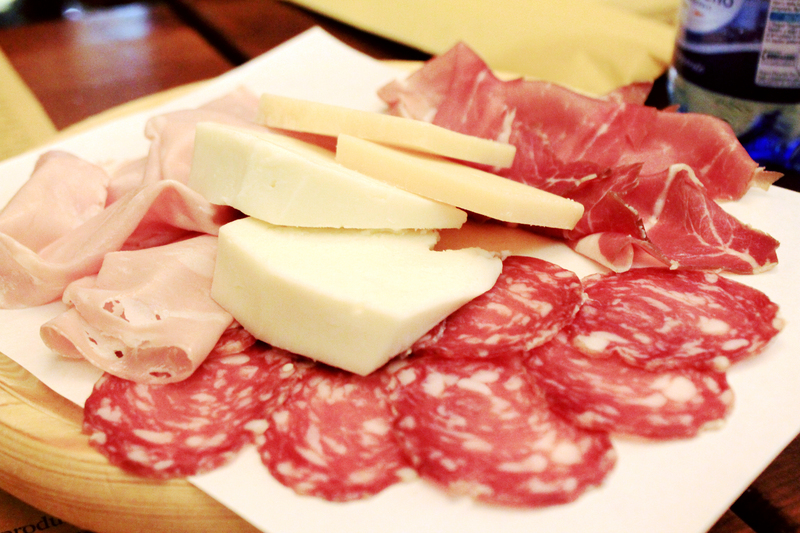 Here’s a Foodie Travel Guide to Bologna! Oh Italy, you’re my favorite. I tend to not pick favorites but I fell in love with Italy. More specifically, the city of Bologna. History also states it is where mortadella, lasagna, tortellini, tagliatelle alla bolognese where all born, so even more reason to truly fall in love with this historically culinary city. We arrived in Bologna by way of Venice, where we took a 2-hour train from the Stazione di Venezia Santa Lucia to Bologna Centrale. When deciding which Italian cities we would visit on our trip, we decided Venice, Bologna, and Rome would be the ones we’d explore on this specific trip. Each chosen for a specific reason: Rome for the architecture and religious establishments, Venice for the gorgeous canals, and Bologna for the food. Granted, I’m not stating that neither Rome nor Venice had great food, because they did, but the food we encountered in Bologna was unlike any other. There are plenty of hotels and inns in Bologna, but we choose to stay in an Airbnb because we wanted to be able to cook a few meals while there (which in reality, we probably did once because we wanted to eat all the foods!). We stayed at this Airbnb and it was probably 20 minute walk from the center of the city, which was a great way to walk off all the pasta we were consuming. It’s also super simple to use the public bus system, so we did that a few times when walking wasn’t an option (too late or raining). Our host Walid was incredible, stocked the kitchen with so many delicious amenities before we arrived. Everything from coffee, milk, juices, bread, crackers, jams, Nutella, cereals – so thoughtful to have these! And now…the sole reason we went to Bologna! First of all, nothing is better than being on vacation in Italy and walking through the local farmer’s markets. That’s one of the reasons we choose to stay in an Airbnb so we could have the opportunity to shop local foods and prepare them in our kitchen. As chefs, this is very important to us – it makes us more creative and teaches us about new items and how to prepare them. Depending on the time you visit, you’ll see a variety of seasonal produce. We visited in March, which is pretty much a cold winter month, but as you can see, Bologna food markets source from the warmer climates of Italy to bring in produce from all over the country. If you’re an artichoke lover, the end of February into the month of March is peak artichoke season and you’ll find them everywhere from markets to menus. A must if you love these gorgeous vegetable! 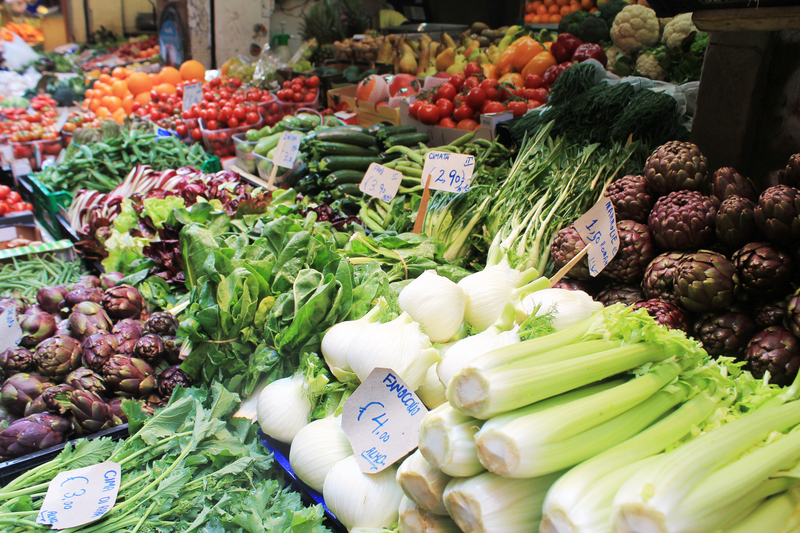 This is one of the best markets in all of Bologna and is the historical center area bounded by piazza Maggiore, via Rizzoli, piazza della Mercanzia, via Castiglione, via Farini, piazza Galvani and via dell’Archiginnasio. You can explore the market on your own, taking in the sights, sounds, and aroma that the market has. It’s incredible both during the daytime or the night, with vendors selling everything you might need to make a meal. 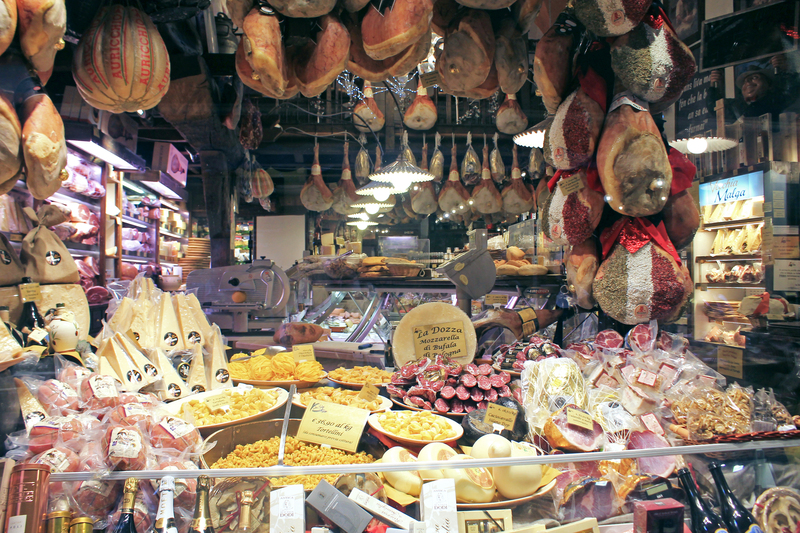 Produce shops, wine stores, cured meats hanging from cafes, ancient fish stalls, and the classic pasta shops will entice you at every corner. Explore more of the market with this visual tour by Travel Photo Discovery. and finally a traditional ice-cream shop, where we learned that the best gelato shops don’t display their ice cream in colorful mounds, but in stainless steel containers, covered with a lid, so the ice cream isn’t subjected to air and temperature changes! The tour was a small group, barely 10 guests, so it made it the perfect way to explore this city. We walked along the narrow streets between vendors and shops, talked amongst ourselves about our travels, and delighted in everything we ate together. Not only are food tours great to discover a city, but the friends you make are some of the best! Book a tour with Amazing Italy for your next trip to Bologna! Bologna is the birthplace of ragù alla bolognese, the traditional meal sauce that accompanies pasta dishes. The earliest documented recipe of an Italian meat-based sauce (ragù) served with pasta comes from late 18th century Imola, near Bologna and a recipe for a meat sauce for pasta that is specifically described as being “bolognese” appeared in Pellegrino Artusi’s cookbook of 1891. You can find it everywhere, even as to go options like the picture below. Bottega Portici is the new high-quality 100% Made in Italy street food, where you stand in line to order your pasta, maybe a small glass of wine, and they’ll give you a buzzer to let you know your food is ready. It host and open kitchen where you can see the chefs making endless amounts of fresh pasta. 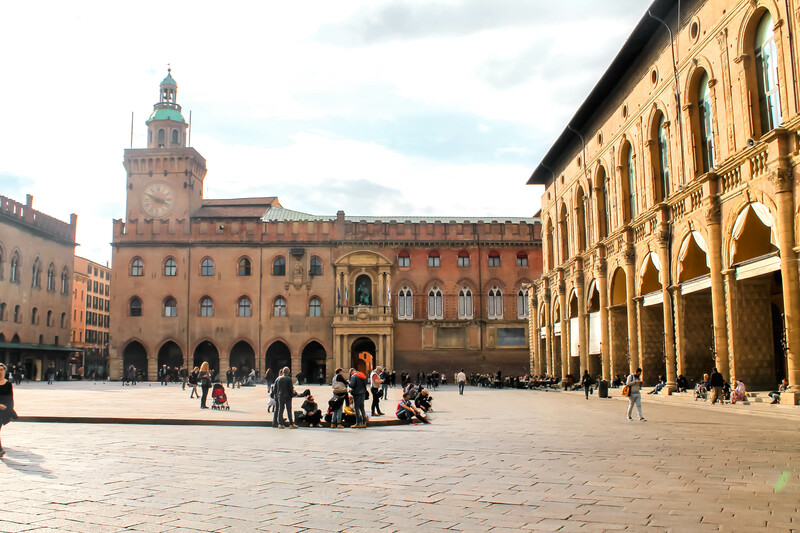 Located in the historic Piazza di Porta Ravegnana, it’s a must when visiting Bologna. Another pasta specialty that originated in Bologna is the classic tortellini, which we ordered every time we saw it on the menu. But if you’re looking for a perfect date night restaurant, Il Rialto on via Rialto 23/C is just the place. Here we tasted our first bites of true tortellini and fell in love. 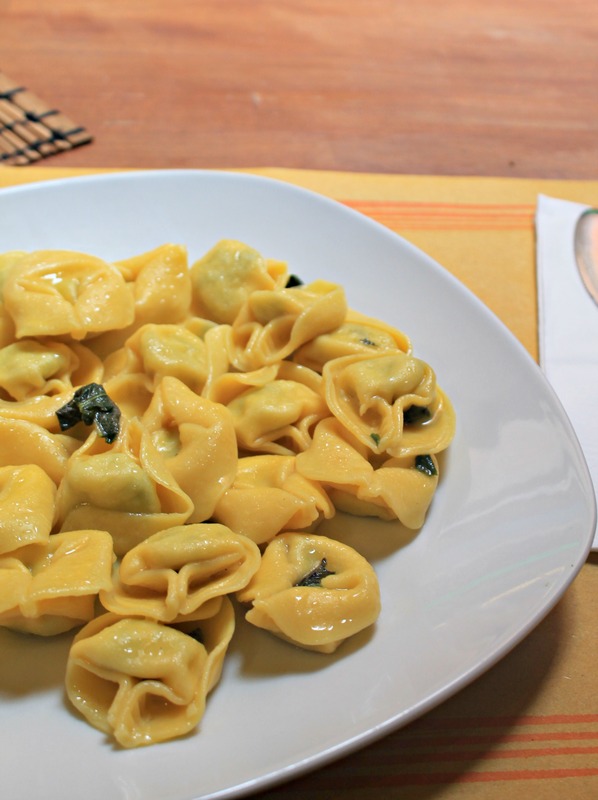 There are many legends on how tortellini was created, but my favorite one is as follows: Originated in medieval Italy and tells how Venus and Jupiter arrived at a tavern on the outskirts of Bologna one night, weary from their involvement in a battle between Modena and Bologna. After much food and drink, they shared a room. The innkeeper, captivated by the two, followed them and peeked through the keyhole. All he could see was Venus’s navel. Spellbound, he rushed to the kitchen and created tortellini in its image. Bologna Welcome has a great tortellini in brodo recipe. Because dessert normally entails gelato and in Bologna, it will be the best gelato of your life. While on our food tour we were given the best tip on how to scout out the best gelato shops: choose a gelato shop that does not display their ice creams. This might sound like an odd tip, but here’s the thing. When you see those gorgeous displays of swirly gelato in the case, you’re looking at gelato that absorbs smells, that fluctuates in temperature, that ices up due to those changes in temperature. Find a gelato shop that keeps all their gelato covered up with lids, where you’ll have to read the flavors off of a menu, instead of choosing by sight. The gelato in Bologna is some of the best, so don’t skip it! Our favorite gelato shop was Cremeria Funivia, located on via Porrettana 158/d. In all, I hope this Foodie Travel Guide to Bologna, Italy has you convinced you need to book a trip to Bologna in 2018. If not, below are some links to more Bologna food travel guides you should explore – see you in Italia!